She further wrote, asking for support, “The world needs to care. We need to care. These kids are our future.” Did she ever show her concern for the Kashmiri Pandits who are refugees in their own motherland for the past 28 years? Did she ever seek justice for the Kashmiri Pandit women and children who were gangraped and murdered during the Exodus period in 1990? Thousands of Kashmiri Pandit refugees are still waiting to go back to their homes in Kashmir. But no neither the media nor human rights organizations ever speak on this issue. After violence in the Western Rakhine State of Myanmar, most of the Rohingyas fled to India, seeking refuge. They have settled across the country including Jammu, Hyderabad, Haryana, Uttar Pradesh, Delhi-NCR and Rajasthan. The union home ministry has said illegal migrants are easy targets for recruitments by terrorist organisations. According to official figures, there are 40,000 Rohingya refugees in India. Unofficial count ranges in lakhs. As per an Amnesty International report reported by Republic, 99 Hindus, including women and children were abducted and massacred by Rohingya terrorists in August 2017. During the mayhem, the terrorist group had denied any involvement. The reports also revealed details about how the Hindu women, children and men were first robbed and bound and then brutally murdered. Reports about mass graves discovered in Rakhine region of Myanmar had hit the headlines last year, which continued for days. According to the report, the Arakan Rohingya Salvation Army (ARSA) killed 53 Hindus, mostly children in ‘execution-style’ in the Kha Maung Seik village cluster in northern Maungdaw of Rakhine State. 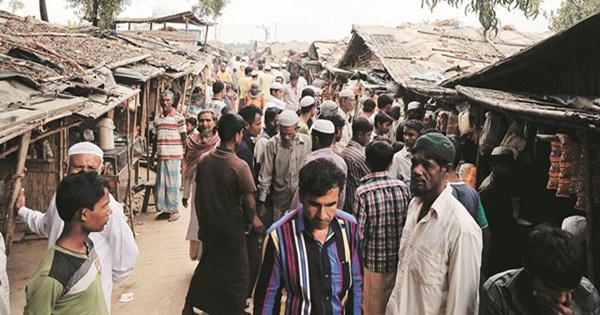 Last year, the Union Home Ministry’s order to deport Rohingya Muslims to Myanmar led to filing of petitions in the Supreme Court against the move. Union Minister Kiren Rijiju had said that Rohingya Muslims were illegal immigrants in India and also said that nobody should preach India on the issue, irrespective of whether they were registered under the United Nations Human Rights Commission. Following appeal by petitioners, the Supreme Court had said the state should strike a balance between human rights and national interests while dealing with the issue. The apex court also granted liberty to the petitioners to approach it for redressal in case any contingency arose during the intervening period. Featured image courtesy (representation): The Indian Express.